If the Times Square Ball is any indication, the new year is arriving not a minute too soon. It's that time of the year again to make resolutions, and number one on the 2013 list is to stay away from the infected websites -- and your LakeCountyEye means it this time. One infection-free website is the McHenryCountyBlog. The website had been infected with some icky erectile dysfunction malware. Back around Thanksgiving, operatives in search of erectile dysfunction drugs had to look no farther than the McHenryCountyBlog, which was loaded with hidden hyperlinks from foreign websites where these same erectile dysfunction drugs were available -- and without a prescription! your LakeCountyEye schooled the disoriented libertarians at the MchenryCountyBlog on how to remove those unwanted -- heh heh -- trojans from their website. Their website is now safe to visit again -- lookin' good McHenryCountyBlog! Every year state law requires the posting of salaries and fringe benefits exceeding $75,000 for those employees under the Illinois Municipal Retirement Fund. Apparently reading them all at once can induce drowsiness. It is unknown whether the tireless tax fighters at the McHenryCountyBlog are old enough to have voted for Teddy Roosevelt. But even if they cast their ballots for Woodrow Wilson, the public sector pensioners at the McHenryCountyBlog can still boast that they speak softly and carry a big stick! Operatives travelling to Springfield on January 9 to see David McSweeney sworn in will find themselves a day late and a dollar short. Plus two days. Not to mention eighty bucks worth of gas. Gaffney, a Lake Barrington Republican who lost his primary bid this year, resigned this week, and McSweeney will be sworn in Jan. 6. That's when state lawmakers will be in their so-called lame-duck session, possibly voting on last-minute efforts to legalize gay marriage, ban certain guns and cut teacher and state worker retirements. Your LakeCountyEye will not speculate why Gaffney resigned in advance. However McSweeney needed to be caucused-in to be eligible to claim the seat before the end of the session. So it is a safe bet that some sort deal was brokered in advance and that Gaffney did not leave in a huff. Likely it was in a late model sedan, perhaps bound to Springfield where all the lobbying and legislative aide jobs are. 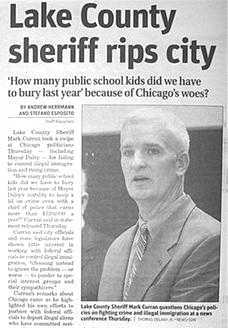 Lake County will now sleep well knowing that gays will not be able to get married and that guns will not be banned and that teachers will not get their pensions -- not with a true Republican like David McSweeney on the watch. Your LakeCountyEye has been told that the news did not sit well with one Lake County Republican, County Board Chairman Aaron Lawlor. It is rumored that Lawlor was promised Gaffney's seat and had been observed measuring the drapes at the District 52 State Rep office in Springfield. In related news, it is widely believed that John Boehner may fail in January to be re-elected as Speaker of the House. And Aaron Lawlor has been recently observed measuring the drapes at the Speaker's office in Washington DC. That familiar December deadline has snuck-up again and, as always, sooner than anticipated. Operatives are sweeping through all the Lake County shops and malls, in desperate search of that one last perfect petition signature. Haha, the quadrennial off-year election for townships and municipalities will be held in April of 2013. Those who hope to be on the ballot must submit nominating petitions by December 26. If you haven't yet, your petition must be in the hands of your township or village clerk before the December 26 deadline. Which means there better be someone working at your township or village hall who can accept your petition -- all on the day after Christmas. Good luck with that! If you happen to be an operative short a sheet or two, your LakeCountyEye recommends renting Santa's naughty/nice list -- which will be adequate to pad any deficient petition packet. And as a bonus, Santa's list doubles as a goldmine of oppo research. With the addition of Santa and Rudolph, these alone are enough names to fill up a entire petition sheet. Just sayin! Where else but in Illinois would an operative be caught stuffing stockings one night -- and ballot boxes the next? Enjoy! In the meantime, look for your LakeCountyEye. Making a list. Checking it twice. Asked who was urging him on, Walsh responded: "The best kind of people in the world — real people, activists, conservatives and everyday Republicans all over the state." These developments have not escaped the notice of actual Lake County Republican, Aaron Lawlor, the brand-spanking-new Lake County Chairman. Your LakeCountyEye has been told that Lawlor burns to obtain a higher office as well, before his term on the County Board expires in 2016. Time, however, is already running out for anyone who wants to be a marquee candidate on the 2014 ballot. Your LakeCountyEye advises Lawlor to act soon or he will find himself a Republican candidate for Comptroller or Superintendent of Schools or some other unsexy down-ballot position. The 2014 Election is Only Two Years Away! Results will be forwarded to Chairman Aaron Lawlor, c/o the Lake County Board. This is scientific data -- please, no freeping the poll! Yes Virginia, There Is a Constitution! No one loves their guns more than the homesteaders of Fremont Township. Arguably Lake County's wild wild west, Fremont Township is where they say the free-range chickens there would prefer to be at the gun-range, instead. 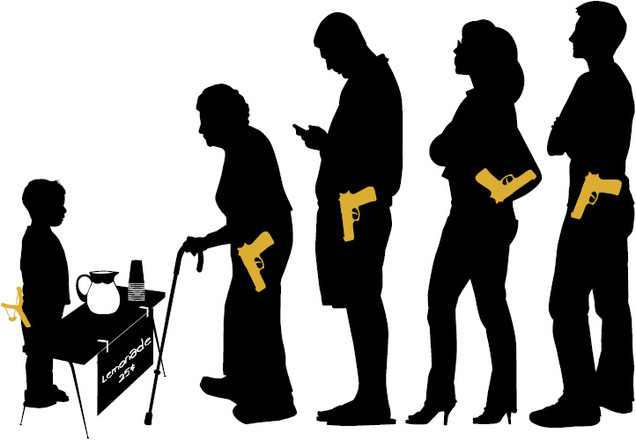 And now that a Federal Court has thrown out all restrictions against concealed-carry in Illinois, every Fremont Township local, to a man, eagerly anticipates the day when he can look his neighbor in the eye and say: "Is that a concealed gun in your pocket, or are you just happy to see me?" Sullivan, a Mundelein Republican, called the ruling "historic" and said now the sides have to negotiate what kinds of fees, training and restrictions a concealed carry law in Illinois should include. "Those of us that support the Second Amendment are glad this came down, finally," Sullivan said. Sullivan recently sat down with your LakeCountyEye for an in-depth interview to explain why his right to conceal a lethal weapon on his person cannot be infringed, even in the slightest. Haha, psych! -- as if Ed Sullivan sat down for a one-on-one with your LakeCountyEye. (Particularly for this story.) Instead, your LakeCountyEye downloaded Sullivan's iTune playlist from his Facebook page. Here are ten hits to load & play during that important backyard beer-can target practice time. Be sure to pump up the volume! Who Shot Ya? / the Notorious B.I.G. Look for your LakeCountyEye shooting up to number one with a bullet. If the scrapheap of history did not exist it would be necessary for Joe Walsh to invent it. Why? Because that's where Walsh has last been seen -- on the scrapheap of history. For those operatives wishing to canvass the scrapheap of history, it can be visited at the American Legion Hall in Wauconda, the site of Walsh's final townhall meeting. The Eighth District Congressman, and scrappy rooster, Joe Walsh held his last townhall ever this weekend ... or so he says. Your LakeCountyEye suspects different. There are lots of high quality electoral pickup opportunities sitting, like the elephant in the room, on the horizon -- including Governor, Senator and 10th District Congressman. Your LakeCountyEye has learned that ambitious Lake County politicians like Mark Curran and Aaron Lawlor are already eyeing these offices; with Walsh on board they would be three amigos. Not only did Walsh lambaste President Barack Obama and Democrats, he said his fellow Republicans in Congress don't "have the courage" needed to stand up for conservative principles. He said he wouldn't let his Republican label stop him from speaking his mind. "You are looking at an odd duck," Walsh said. And, for the four weeks until the new Congress is sworn in, a very feisty lame duck. Note to ops: the Herald made a joke. Haha, too funny. In related news, the Lake County Clerk's office mailed voter registration applications to Odd Duck Walsh & Lame Duck Walsh. And no, this particular Burmese python was not mailed a voter registration application from the Lake County Clerk's office. The animal -- affectionately named McSqueezy the Python -- has caught the attention of the Chicago Tribune's Creepy Cartoonist. The Creepy Tribune Cartoonist has launched a contest to give a name to McSqueezy the Python. It does remain unclear why the Trib is sponsoring a contest to find a name for, erm, McSqueezy. For that matter, it is unclear why the Trib is sponsoring a contest to find a name for a beloved Waukegan python that was captured and euthanized some three months ago, back in September. This all may be an indicator of how slowly news travels out of Lake County -- and down into the concrete jungle. Anyone caught stealing your LakeCountyEye's contest idea will be banned for life. Your LakeCountyEye means it this time. Whose Photo Does Not Belong in this Lineup? the good-looking Aaron Lawlor spanked an incumbent David Stolman in a mano-a-mano winner-take-all duel-to-the-death as to who would preside over the Lake County Board. Lawlor, who is barely 30 years old, is now the youngest Lake County Board Chair ever. However putting that in perspective, 30 is 210 in dog-years. And at 210 years, Lawlor would rank among of some the eldermost of his fellow County Commissioners. The Republican Lawlor could not have pulled it off without support from enough Democratic Board Commissioners to ensure a victory over the other Republican, Stolman. One misinformed source informed your LakeCountyEye that not since Cardinal Richelieu installed the Dauphin Louis XIII to the Bourbon throne has an evil cabal that brazenly maneuvered someone that inexperienced that abruptly into high office. "Cardinal Richelieu would have been proud"
We will pursue the extension of Route 53 vigorously, utilizing all of our leaders and build on the foundation that has been laid over the last several years. His victory is regarded as a win for Route 53 proponents. It is also a win for your LakeCountyEye, who looks forward to at least 2 more years of Synthetic Hair Extension Route 53 Extension jokes.